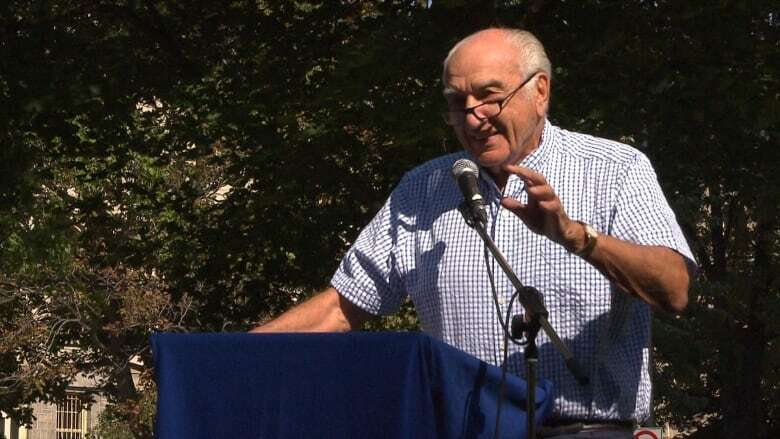 On the 11th anniversary of the Dawson College shooting, the creator of the sculpture he calls The Climber hopes his gift to the CEGEP will inspire students to ascend to new heights in their academic and personal lives. 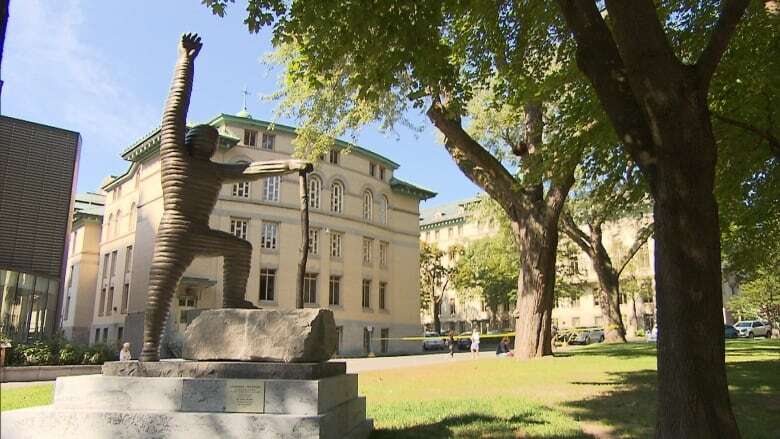 Dr. Harry Rosen, a McGill professor emeritus of dentistry, told CBC News that he's proud to play a small part in the healing process that the Dawson community has undertaken since the 2006 shooting that claimed the life of one student, Anastasia De Sousa, and left 16 people wounded. "Dawson College is an institution that does continually motivate people to strive for more," said Rosen. The statue is of a mountain climber on a pyramid-shaped platform. It's made entirely of natural stone and took Rosen six months to complete. 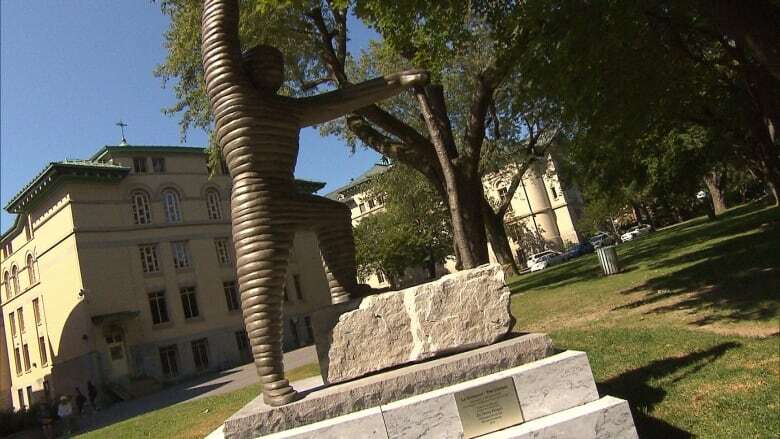 He's hoping his gift, erected on the campus lawn just off Atwater Avenue, will have an impact on students. "You see steps that the climber is mounting on," Rosen said. "He's gotten to the top. He's now at the top on his mountain of rock, but he still has one arm up in the air, seeking the ultimate." Rosen compared crafting the sculpture to his work as a dentist, saying both required precision and working with tools. He found the stones at quarries around the country — 35 tonnes, in all. Dawson College student Cheranda Fraser Williams attended the unveiling event and said she's happy with the new campus artwork. "I thought this gesture was a really nice thing, not just for students or the college, but for the community as a whole." Rosen, whose wife and grandson were at the ceremony, hopes that the people who see the statue will convey his message to students for generations to come. "To me, as a student, I'm going to go through life climbing this mountain, learning more and more and becoming a better and better student and a better and better person," he said. The college is marking the anniversary of the 2006 tragedy with events all week, many of them taking place in the campus's memorial Peace Garden.